I have another great gift in a jar idea for you today! 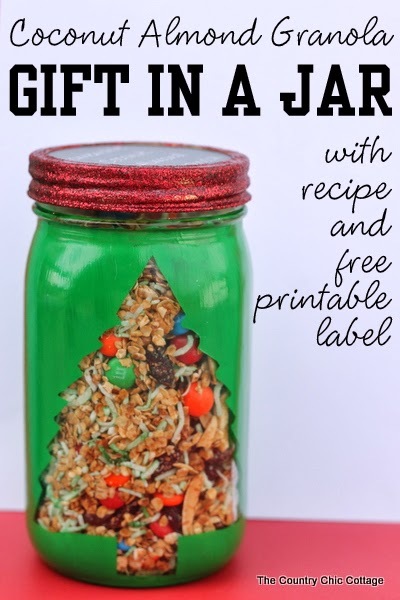 This Coconut Almond Granola Gift in a Jar is the perfect neighbor or teacher gift. Or you could use the recipe to make up a big batch to keep on hand for snacking during all your holiday prep. I think gift wrapping would be a lot more fun if you had a bowl of this granola to snack on while you’re working! Angie from The Country Chic Cottage has the full recipe for you, as well as a printable to make this sweet Christmas Tree Jar! This is such a great quick and easy gift idea. Make sure you visit Angie’s other blog, Crafts with Jars, where she features all sorts of Mason Jar projects and gift ideas. I love her roundup of 15 Jar Lid Ornaments ideas! More than 30 edible gift ideas. 100+ Handmade gifts for grown ups! Last minute gift idea: Movie Tickets. Easy DIY wrapping paper with Bic Mark-It markers.